12° to 7°C with moderate wind. Up at 6 and set off for breakfast at the pinnacle cafe, Capel Curig. Excellent and at a good price too. Bought a pair of summer gloves for days like today. Nice in the valleys but cold aloft. The gloves I really liked were £85! No way! From Capel Curig, I climbed onto the Glyders from the gentle eastern slope. Today was all about walking the length of the range and something good happened as I went along. At each summit, the cloud lifted or even cleared. By the by mid afternoon, the sun was out and the rocks were in sharp relief. As often on the year’s first proper hike, the descent was quite hard and slow. I came down off the range behind Llyn Idwal. Place have made this ground far easier. 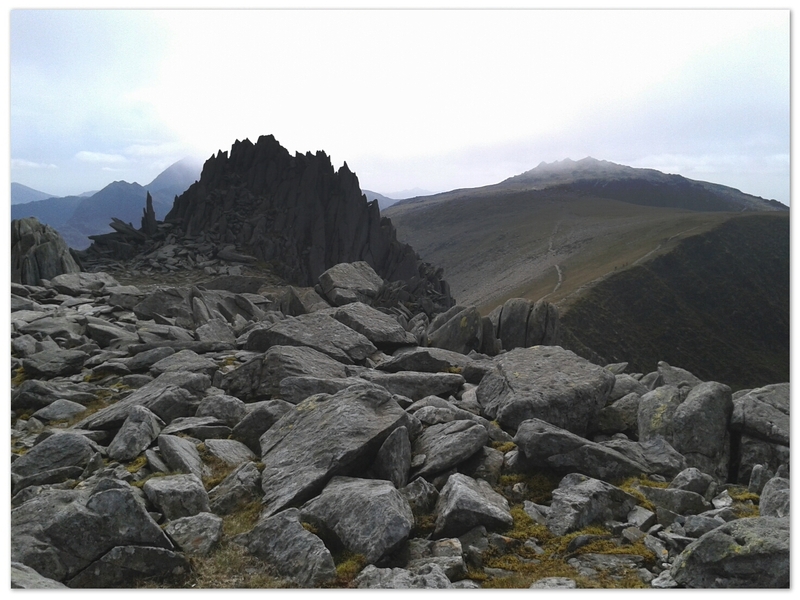 Coming off Glyder Fawr was the worst bit with its loose shattered rock on a bed of soil on a steep slope. I should have some good photos to show off when I get back. This entry was posted in Hiking, Quality Mountain day and tagged Glyders, hiking, Snowdonia. Bookmark the permalink.